The first time I tasted a pupusa was in La Antigua Guatemala and I thought it a most delectable and ingenious culinary invention. And while the pupusa has its rightful origins in El Salvador, it has, to the delight of many, quickly found its way to the tables of Guatemala and other countries throughout Latin and Central America. 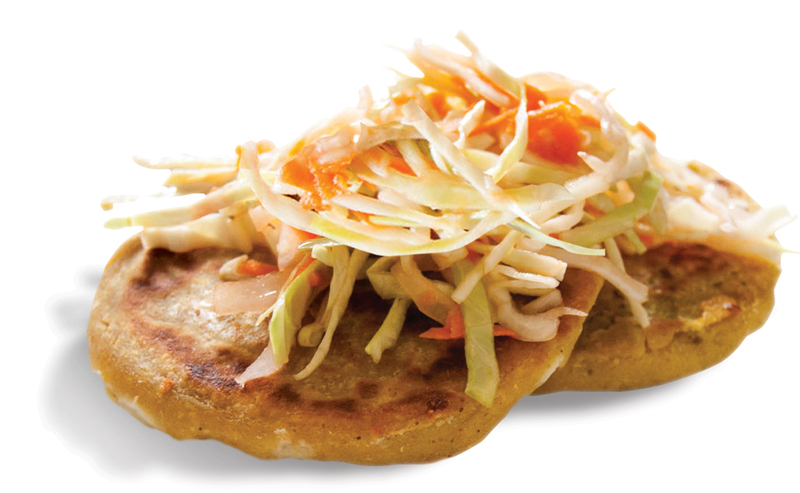 A traditional Salvadoran pupusa consists of a thick, handmade corn tortilla that is typically filled with a blend of cheese or meat and topped with curtido, a lightly fermented cabbage slaw, and a tangy red salsa. It’s the perfect food: simple, nutritious, colorful and inexpensive. 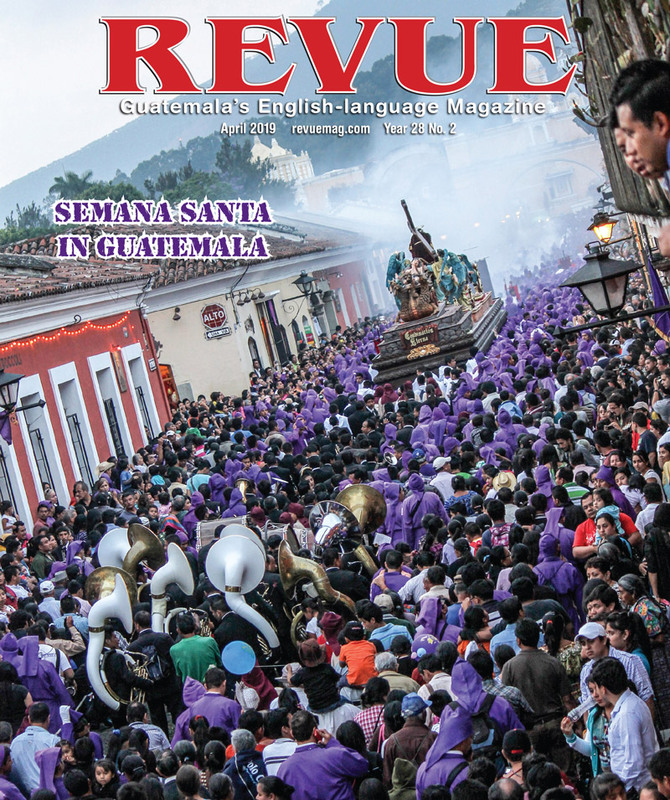 It wasn’t until the 1960s, when populations in El Salvador began to migrate, that pupusa stands started making their way into neighboring Honduras and Guatemala. With this migration came variations in size, shape and fillings. 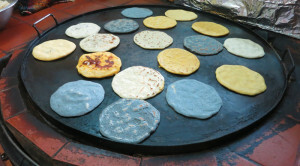 In Guatemala, for example, during the 1970s, pupusas were said to have taken on a half-moon shape. More typically considered a street food, pupusas are served at numerous stands and smaller restaurants scattered throughout Guatemala, offering variations on this appetizing concoction. Serving pupusas for breakfast has also become a tradition. 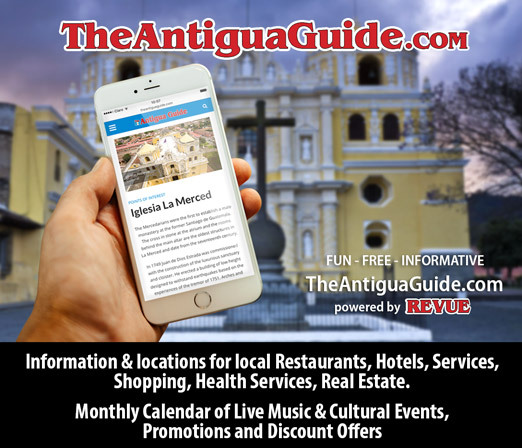 According to Chef Jorge Gonzalez at El Tenedor del Cerro in Antigua, pupusas have been a part of the restaurant’s breakfast menu for almost five years now. The handmade corn tortilla is prepared using masa de harina (cornmeal dough), which has its origins in Mesoamerican cuisine. Chef González said that El Tenedor uses three kinds of Guatemalan corn—black, white and yellow—to prepare pupusas. “This way,” he explained, “patrons may request which type of cornmeal as well as which of the three fillings they prefer.” The three most common pupusa fillings are cheese (queso), cooked and seasoned pork meat (chicharrón) and refried beans (frijoles refritos). Masa de harina is the traditional flour used to make tortillas and, literally translated, means “dough flour.” González went on to explain that masa de harina has been specially treated with “cal,” which is short for calcium hydroxide or “lime” and makes the dough more nutritious because it helps to release the niacin in the corn. “It’s also a lot easier to digest,” he added. Because of the meal’s growing popularity, many pupuserias—restaurants that specialize in pupusas—have expanded their selection of fillings to accommodate more sophisticated palates. At Pupuseria El Sapo y la Rana in Antigua on the east side of Calzada Santa Lucía, the choice of pupusa fillings is astonishing. And they’re delicious! Owner Dora, who hails from El Salvador, offers both traditional and non-traditional pupusas filled with such savory delights as asparagus, jalapeno, chorizo, chicken and ham. When the delicate and aromatic loroco bud is in season, you may also feast on a pupusa filled with this flavorful and edible flower, which is native to the region and El Salvador. A relative newcomer to Antigua on the south side of 4a calle just east of 1a avenida is Pupusas Antojitos Salvadoreñas, which serves up an exotic pupusa “Hawaiana” stuffed with ham, cheese and pineapple. My absolute favorite is the cheese, mushroom and garlic pupusa. In addition to the traditional repollo (cabbage slaw) and salsa, this pupuseria offer customers a very hot and spicy garnish of pickled carrot, onion and jalapenos that will surely set you on fire if you’re so inclined. Refacciones y Pupusa Odilia on the south side of 3a calle between 4a and 5a avenida has a seating capacity of just 10 but the food experience here is quite genuine and typical. At Odilia’s, you only have a choice between the three traditional pupusa fillings of queso, chicharron and frijoles refritos, but you do get to interact with the lovely Maya ladies who grill your delicious pupusa right in front of you a la plancha! And they are only too happy to top off your pupusa with a generous dollop of guacamole if you like. Just don’t tell a Salvadoreño you did this.